tato naṃ dukkhamanveti cakkaṃva vahato padaṃ. tato naṃ sukhamanaveti chāyāva anapāyinīti. happiness follows him, as a shadow that never leaves. Handa mayaṃ khemākhemasaraṇadipikāgāthāyo bhaṇāma se. that is not the refuge, having gone to which on does not release from all suffering. and the Noble Eightfold Path, the way to the ceasing of suffering. thus is the refuge having gone to which one gains release from all suffering. idhevā naṃ pasaṃsanti pecca sagge pamodati. receives praise here on earth and after death rejoices in heaven. 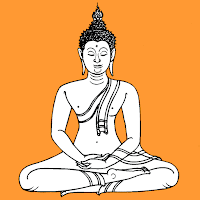 "he is not poor," they say, "his life has not been in vain,"
tasmā saddhañca sīlañca, pasādaṃ dhammadassanaṃ anuyuñjetha medhāvī saraṃ buddhānasāsananti. so remembering the Buddha's teachings, the wise should cultivate conviction and virtue, faith and Dhamma-vision. khīṇāsavā jutimanto te loke parinibbutāti. glorious, free of the effluents, they are peaceful in the world. they have arisen and pass away, their total stopping is supreme bliss. samūlaṃ taṇhaṃ abbuyha nicchāto parinibbutoti. one pulls out craving, root and all, free from desire, totally calm. doing his duty ardently, today, for who knows? Tomorrow, Death may come. taṃ ve bhaddekaratoti santo ācikkhate munīti. has truly had an auspicious day thus says the Peaceful Sage. 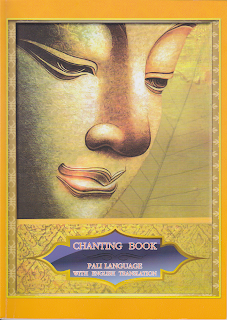 these are the teachings of all Buddhas. Through the round of uncountable births I wandered without finding the insight mind. The house builder I was seeking, birth again and again, is painful. House builder, you are seen! You will no longer build my house for me. All your rafters broken, the ridge pole destroyed. Gone to the unconditioned mind, the mind has attained the end of craving. Handa mayaṃ pacchimabuddhovādapāthaṃ bhaṇāme se. these are the last words of the Buddha. Evamme sutaṃ ekaṃ samayaṃ Bhagavā, sāvatthiyaṃ viharati, Jetavane Anāthapiṇḍikassa, ārāme. I have heard that at one time the Blessed One was staying in Savatthi at Jeta’s Grove, Anathapiṇḍika’s park. Tatra kho Bhagavā bhikkhū amantesi bhikkhavoti. This orderliness of the Dhamma, all processes are inconstant. directly awakening and breaking through to that, he declares it, teaches it, describes it, sets it forth. he reveals it, explains it, and makes it plain: all processes are stressful. all phenomena are not self. directly awakening and breaking through to that he declares it, teaches it, describes it, sets it forth. paññapeti paṭṭhapeti, vivarati vibhajati, uttānīkaroti: sabbe dhammā anattāti. 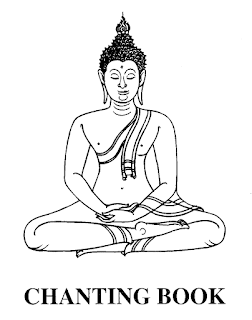 Idamavoca Bhagavā, attamanā te bhikkhū Bhagavato bhāsitaṃ, abhinandunti.